What Do You Find Out When You Put An Alligator On A Treadmill? When you come across a paper on "alligator kinematics," it's time to pay attention. Somewhere, at some time, a scientist wanted to find out deep secrets of evolution and decided the best way to do it was putting an alligator on a treadmill. Crocodilians have two ways of getting around on land. There's a sprawling crawl that drags their belly along the ground, and there's the "high walk." The high walk lifts most of their body up off of the ground, and allows them to move fairly fast. Many species, like lizards and salamanders, are crawlers. Others, like dinosaurs and birds, walk upright and erect. Scientists posited that alligators and crocodiles represented a midpoint between these two modes of transportation. To find out about the transition from crawl to walk, they investigated the matter, resulting in the delightful paper, "Locomotion in Alligator Mississippiensis." The paper has everything. Alligator pelvic diagrams. A series of photos of an alligator on a treadmill. Detailed discussion on how the timing and angle of alligator walks differ from those of lizards and birds. And, in the end, complete futility. Well, I shouldn't say that. Anything that gives us more complete knowledge about the world isn't completely futile, but as it turns out, the gators aren't the missing link in crawling versus walking upright. "Essentially one could say that the crocodilian sprawl is a lower version of the "high walk" or a low walk. 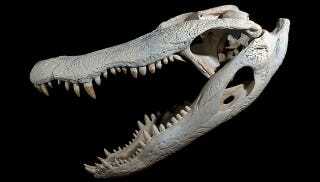 Crocodilians . . . do not switch from a primitive sprawling posture to an intermediate semi-erect posture as posed in the Introduction. Furthermore, because it is only used to move short distances or in transitions to and from a high walk the sprawl should perhaps not be used for comparisons made to understand the evolution of vertebrate postures." It's rare that we see a person ask a deep, exciting question, follow their line of inquiry, prove their initial supposition entirely wrong, and publish it anyway. This is what is great about science. Can studying this help us understand important questions about the history of life on this planet? We looked into it, for a long time, analyzed it carefully, and no. No it cannot. But we know that for sure, now.